What are the symptoms of a BKW Compressor not working? No cooling. Breaker trips. A failing compressor may make significant noise on startup. 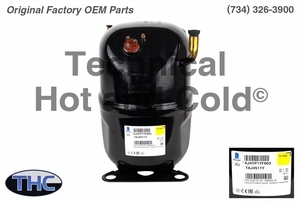 Technical Hot and Cold offers the BKW B1000356 Compressor OEM replacement part for sale online and over the phone. Call (734)326-3900 to speak with a technician for additional information on each BKW replacement part.